The Decades-Old Gun Ban That's Still On The Books : It's All Politics In 1986, Congress passed a ban on buying and selling machine guns made from then on — with the blessing of none other than the National Rifle Association. Gun law experts say the law was more significant than it seemed at the time. 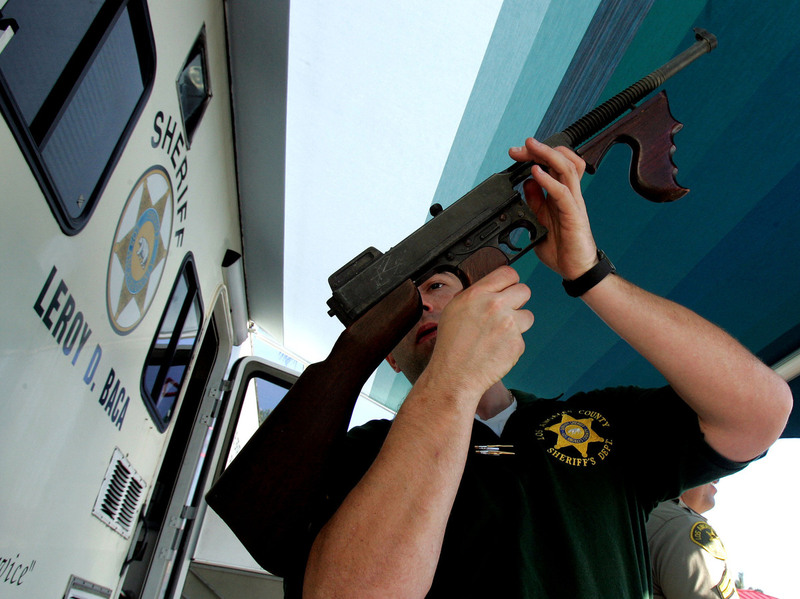 Los Angeles County Sheriff's Department officer Jay Phillippi looks over a fully automatic Thompson machine gun that was turned in during a "Gifts for Guns" program in Compton, Calif., in 2005. When President Obama laid out his proposals Wednesday to reduce gun violence, he included a call for Congress to ban "military-style assault weapons." Lawmakers on Capitol Hill have tried banning certain guns before. Nearly two decades ago, they barred the sale of semiautomatic assault weapons, only to let that law lapse 10 years later. But one gun ban has stayed on the books: a measure Congress passed a quarter-century ago making it illegal for civilians to buy or sell any machine gun made from that date forward. That legislation passed with the blessing of the National Rifle Association, which now opposes gun control measures. In April 1986, after months of efforts, the NRA had finally rallied enough support in the Democratic-controlled House to force a bill onto the floor. The so-called Firearms Owners' Protection Act would undo many of the provisions in the 1968 Gun Control Act, passed shortly after Robert Kennedy and Martin Luther King were shot dead. But just as the bill was about to come to a final vote in that tumultuous House session, New Jersey Democrat William Hughes introduced an amendment. It would forbid the sale to civilians of all machine guns made after the law took effect. There were enough Democrats to pass the amendment, so nobody objected when the presiding officer, New York Democrat Charles Rangel, called for a voice vote rather than a roll call vote on the machine gun ban. Former NRA lobbyist Richard Feldman, who has since parted ways with the organization, tells NPR that Wayne LaPierre, currently NRA's executive vice president, was willing to let the machine gun ban go forward if it meant the larger bill it was attached to would pass. "I remember very well having dinner ... with Wayne LaPierre on the big victory after it passed the House," he says. "And we weren't too concerned about the machine gun issue, but it came back to haunt Warren Cassidy." At the time, Cassidy headed the NRA's lobby, the Institute for Legislative Action. He confirms now that LaPierre, who did not respond to a request for comment, pushed hard to let the machine gun ban stand. "He said, 'I want to do it. I think we have to do it.' So I said yes, and that was the end of the story. It passed, and as we learned immediately, an element of NRA, a very vociferous element of NRA ... determined that it just couldn't be that way," Cassidy says. "We couldn't give an inch. I don't think they ever forgave me for it." Gun laws expert Robert Spitzer of the State University of New York at Cortland says the bill President Reagan signed into law was more significant than it was perceived at the time. "One can view the Congress' action in 1986 to ban civilian possession of fully automatic weapons as something of a kind of a precedent that would open the door for restricting civilian access to semiautomatic, assault-style weapons," Spitzer says. Spitzer says a major reason the machine gun ban met so little resistance was a 1934 law passed a month after outlaws Bonnie Parker and Clyde Barrow were killed in a hail of machine gun bullets. It required machine gun owners to pay a hefty tax, be fingerprinted and be listed on a national registry. As a result, he says, sales of machine guns plummeted. "It is a good example of something that is little known, which is a gun control law that was pretty effective in keeping such weapons out of civilian hands," he says. "So by 1986, when the provision was added to the Firearm Owners' Protection Act to bar any newly produced fully automatic weapon from possession by civilians, it was really a fairly small step to make, because so few of them were in circulation to begin with." That's clearly not the case with the semiautomatic guns that polls show a majority wants banned today.